This colorful popper is tied on a long shank hook to give it a slender "pencil popper" look. 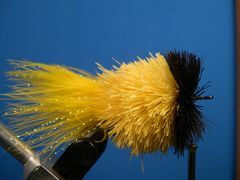 It can be tied in a variety of colors and various materials can be used for the tail including marabou, rubber strands, craft fur, and synathetic flash material. 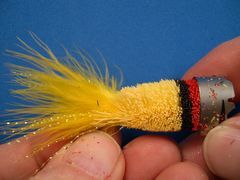 This little popper, composed of a Marabou and Crystal Flash tail and a deer hair body, is about two-inches long. 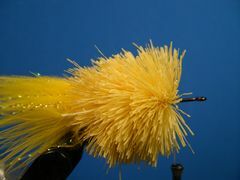 I have tied this fly in a combination of colors including one with a chartreuse tail and body and a white head and another with a yellow tail and body and a black head. 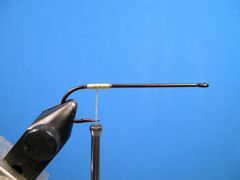 A hook with a 4Xlong shank works best to give the fly the slim cylinderical look that I want to achieve. 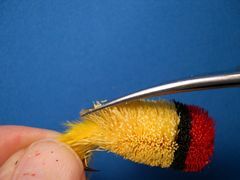 However, the fly can trimmed fatter or slimmer depending on the kind of shape that you want to achieve. You need to have sharp double-edged razor blades to properly trim this fly or any hair bug for that matter. Use double-edged blades not the single-edge type. Single edge blades won't work. The best way to use double-edged razor blades is to divide a blade into two blades. The best way to make two blades out of one is to cut the blade in half length-wise with a pair of household scissors. Deer hair dulls a razor blade quickly. When you begain to experience any resistance during the trimming process it's time to replace the used blade with a new one. Be sure to attach the popper to your leader with an open knot like the Dunkan Loop or the Non-Slip Uni Knot. 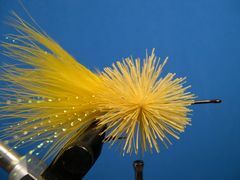 This little popper casts beautifully on a five or six-weight rod with the fly attached to a 7 1/2 foot 3X tapered leader. Pete's Popper doesn't have a weed guard like most other deer hair bugs so you need to be cautious around structure. I generally fish it parallel with the weed line with successive "pops and stops" sometimes leaving the fly set for a considerable amount of time after I pop it. The Marabou tail continues to undulate when the fly is at rest and that's when strikes often occur. Clamp the hook in the vice, crimp the barb, and start the thread at the back of the hook. 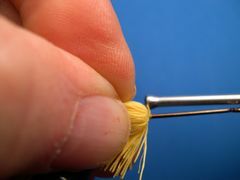 Lay down a short thread base at the rear of the shank as shown. 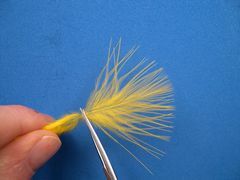 Select a quality marabou feather for the tail and stroke back the fronds to expose about one inch of the tip and stem. 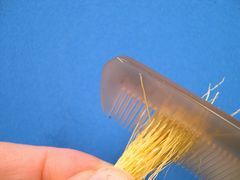 Remove the tip and the stem with you fingernails or your scissors. 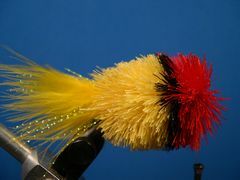 Measure the marabou against the hook. The tail should be the length of the hook. 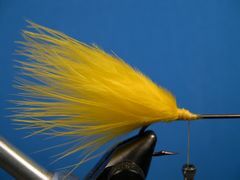 Tie in the marabou tail with several tight wraps of thread. 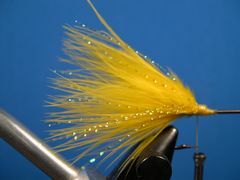 Tie in several strands of Pearl Crystal Flash or Rainbow Thread on both sides of the Marabou tail. 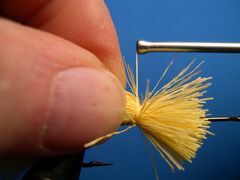 Clip a pencil sized bunch of deer hair from the hide, comb out the under-fur and shorts, and trim the butts and tips of the hair so that you end up with a bundle about an inch long. Spin the first bundle of deer hair on a short thread base in front of the tail. This is the way the first bundle should look after it has been spun on the hook. Once the hair bundle is spun on the hook, grasp the hair with the fingers of your left hand, pull the thread through the hair, and makethree or four tight wraps and a half-hitch against the base of the hair. Now pack the hair tightly with a hair packer. 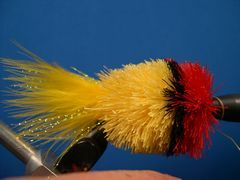 Notice how tightly you can pack it with the Brassie Hair Packer. Take several close wraps of thread forward in preparation for the next bundle of deer hair. Five or six wraps forward and then reverse a couple of turns so the thread ends up hanging in the center of the thread base. 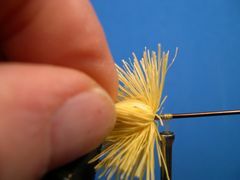 Continue to add bundles of deer hair following the same steps that you used in tying in the first bundle of deer hair. Stop when you reach the two-thirds point on the hook's shank. You need to leave room for the addition of one bunch of black hair and two bunches of red hair. Now spin and pack a bundle of black deer hair. Spin and pack two bundles of red dear hair just as you did the other bundles. Tie off with a couple of half-hitches and remove the thread. Remove the fly from the vice. Clamp a pair of forceps onto the hook's eye and hold it over a "Hot Pot" of steaming water. The Hot Pot is what college students keep in their dorm room to heat up water for soup, coffee, or coca. Put about an inch of distilled water in the bottom of the pot before you plug it in. Don't skip this step. It makes trimming the bug so much easier. If you don't have a hot pot use a saucepan with a half-inch of water on the cook top in your kitchen. 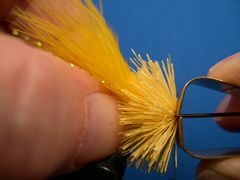 Hold the popper in your left hand and trim it to shape as shown. 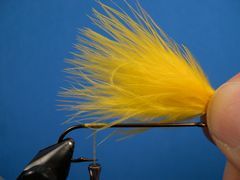 The face of the fly should be 3/8th of an inch square with a flat belly and rounded on the top. 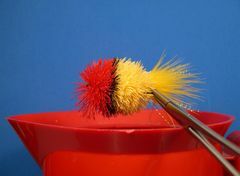 The ideal tools to trim the bug are a double-edged razor blade and a curved serrated scissors. I like to begin trimming with half of a double-edged razor blade. To make two blades out of one, simply cut a double-edged blade in half length wise with a pair of household scissors. You will use both blades during the process because the hair dulls them fairly quickly. When the blade meets resistance as you are trimming, discard it and use the other half. Hold the blade to make a "bow saw" as shownin the photo to form the top, bottom, and sides of the body. Be sure that the body tapers from the front to the back. Use the scissors to trim areas that are suited for its use. The razor blade and the scissors are not mutually exclussive trimming tools. They should be used interchangeably to achieve the desired effect. Leave the tail as it is or shorten it to a lenght of three-quarters of an inch as shown in the photo. 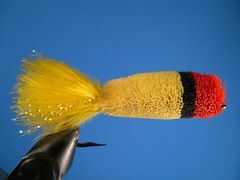 The easiest way to shorten the tail is to pinch off the marabou with your finger tips. In either case your fly is ready to fish.